Months ago I bought a layer cake of 12 Days of Christmas by Kate Spain. 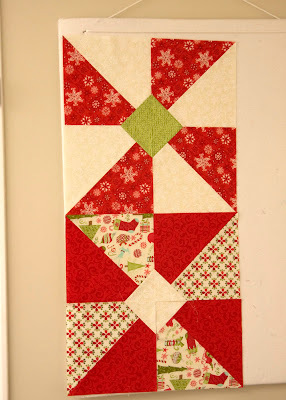 I love her fabrics, and this line happens to be my very favorite Christmas fabric this year (perhaps of all time). I'm also very excited about the small preview of her new line Central Park. While I love the idea of pre-cuts, I'm always stumped by them. I'm afraid to cut them up and can never decide what to do with them. 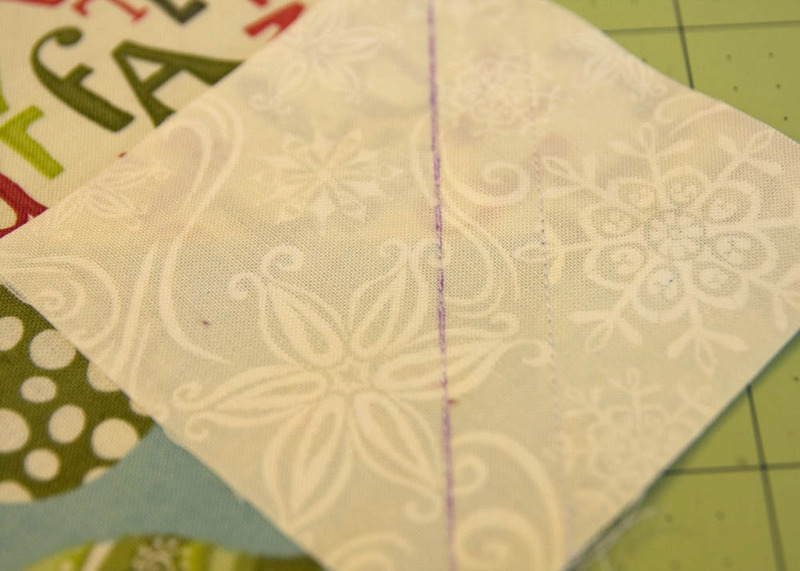 I have serious commitment issues with it comes to pre-cuts. As such this little layer cake has been sitting on my shelf for a very long time. I went through dozens of possibilities in my head, but nothing seemed right. My main problem was that most of these prints are large designs. 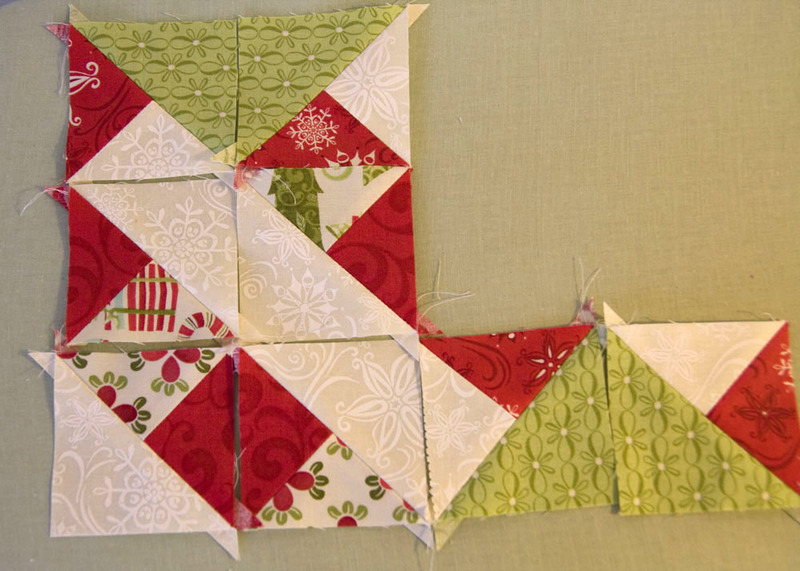 I didn't want to cut too much and lose those images, but I also didn't want to leave the square whole and just sash them. I started cutting a few days ago after finally making a decision! I think it was a good choice. I'm liking it a lot so far. To get the diamond in the center of the pinwheel, I paired each block with a 3 1/2" square and sewed across the diagonal. I was disappointed with how much waste that method created though. 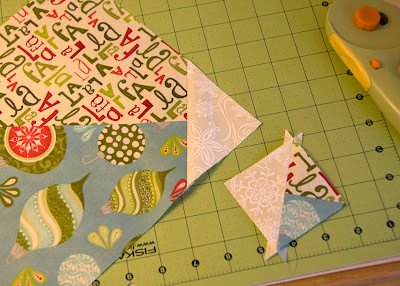 I decided to sew a second line 1/2" down and cut between the two making some super cute little 2 1/2" HSTs. 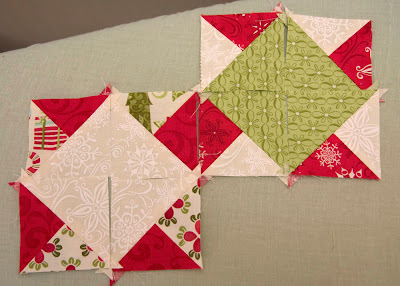 I'm saving these little guys for later for a table runner or perhaps some hot pads. The design possibilities are endless. Super cute! I love 12 Days of Christmas, but I told myself I couldn't buy any more Christmas fabric since I'm sure it will take me years to get through all my Figgy Pudding. I've been making HSTs lately and I am loving all the design possibilities with them too! Love what you are doing! Can't wait to see it completed!! Love it! I also have a problem cutting into layer cakes and charm packs. I think I need to buy more jelly rolls. I don't mind using them up.